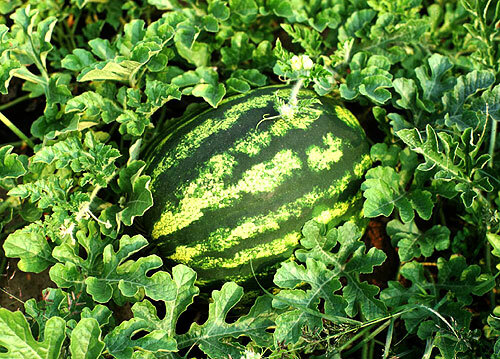 Heat-loving watermelons can be a challenge to grow in cooler regions of New York. To increase success, choose short-season varieties, start them inside, warm soil with black plastic or IRT mulch, and protect young plants with fabric row covers. Prefers warm, well-drained, soil, high in organic matter with pH 6.5 to 7.5. Consistent, plentiful moisture needed until fruit is about the size of a tennis ball. Soil temperatures below 50 F slow growth. Consider using black plastic and fabric row covers to speed soil warming. Sandy or light-textured soils that warm quickly in spring are best. outdoor containers - Bush varieties can be grown in large containers on patios, decks, etc. In many areas of New York, successful crops require starting plants indoors, using plastic mulch to warm soil, and fabric row covers to protect young transplants. Days to emergence: 3 to 5 - In very warm (90 F) soil. About 10 days at 70 F.
Seed can be saved 4 years. If you have long, hot growing seasons direct-seed into garden. To ensure ripening in areas with shorter growing seasons and cooler weather, choose fast-maturing, small-fruited cultivars, start plants inside, and use black or IRT plastic mulch and fabric row covers to warm soil and protect plants. Direct seed 1 to 2 weeks after average last frost when soil is 70 F or warmer. Plant � inch deep, 6 seeds per hill, hills 3 feet apart each way for bush varieties, or 3 feet apart in rows 8 feet apart for vining types. Thin to 2 to 3 plants per hill. For transplanting, sow seeds indoors � inch deep in peat pots (2-inch square or bigger), 2 to 4 weeks before setting out. Set outside 2 weeks after average last frost, 3 plants per hill, hills 3 feet apart each way for bush varieties, or 3 feet apart in rows 8 feet apart for vining types. Transplants are delicate. Keep soil intact when transplanting. Mulch plantings after soil has warmed to help maintain consistent moisture and suppress weeds. If using fabric row covers, remove at flowering to allow pollination by bees. Good pollination is critical to fruit set. Plants require consistent moisture until pollination. Once fruit are about the size of a tennis ball, only water if soil is dry and leaves show signs of wilting. To prevent insect damage to developing fruits, place watermelons on pots or pieces of wood. If growing melons on a trellis, support fruit with slings made from netting, fabric, or pantyhose. Trellising improves air circulation around plants and can help reduce foliar disease problems. Choose small-fruited varieties and reduce plant spacing. Avoid planting cucumber family crops (melons, squash, pumpkins) in the same spot two years in a row. Striped or spotted cucumber beetles - Construct tents of fine netting or cheesecloth or use floating row cover over young plants. Put in place at planting and remove at flowering. Control beetles to prevent bacterial wilt. Squash vine borer - Cut open vines and remove by hand. Squash bugs - Handpick. Bury or compost plant residues after harvest. Flea beetles - Use row crop covers to help protect plants from early insect damage. Put in place at planting and remove at flowering. Control weeds. Powdery mildew - Avoid wetting plants if possible. Water early in the day so aboveground plant parts dry as quickly as possible. Avoid crowding plants. Space apart to allow air circulation. Eliminate weeds around plants and garden area to improve air circulation. Cucumber mosaic virus - Remove and destroy infested plants. Control cucumber beetles and aphids as soon as they appear. Scab - Avoid wetting foliage if possible. Water early in day so aboveground plant parts dry as quickly as possible. Avoid crowding plants. Space apart for air circulation. Fusarium wilt - Locate new plants in a part of the garden different from previous year's location. Plant tolerant varieties. 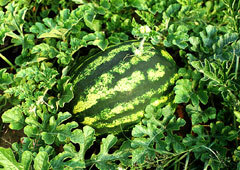 Browse watermelon varieties at our Vegetable Varieties for Gardeners website. When choosing varieties, match days to harvest with the length of your growing season. (Keep in mind that you will plant well after the last frost date and want to make sure your crop ripens well before first frost in fall.) If you have a long enough season, choose varieties with different maturity dates to spread out your harvest, or stagger planting dates of a single variety. Bush varieties have more compact vines, some just 3 feet long. Also base your variety choices on disease resistance, fruit size (stick with smaller fruits in short-season areas or if you plan to trellis the vines), flavor, and color. Seedless varieties may have poor germination and early seedling vigor.